MSCM install | Nogalis, Inc. Sometimes the install wizard for MSCM installs and updates doesn’t work quite the way you would hope. In many cases, I have found that I needed to uninstall MSCM, run through the wizard without actually installing, and run the scripts manually so I can trap and fix errors. 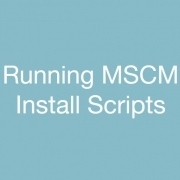 All of these scripts are located at the MSCM install directory, in the cofig folder. Follow the instructions with each script, because in some cases, you will need to stop the application server and in some cases you will need to start it.